Outside of London, Liverpool was the most bombed area of the country. 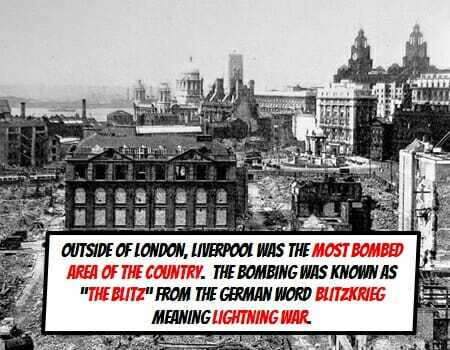 The bombing was known as The Blitz from the German word Blitzkrieg meaning lightning war. The bombing was designed to destroy Britain and demoralise us into surrendering. 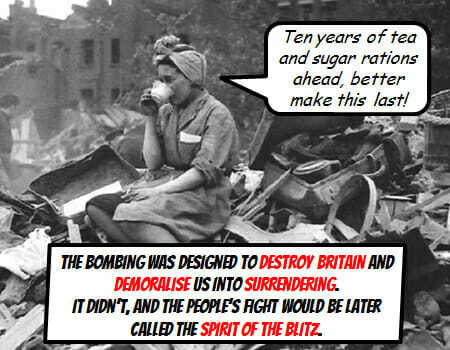 It didn’t, and the people’s fight would be later called the spirit of the blitz. 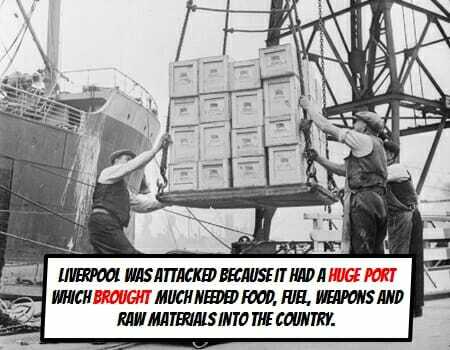 Liverpool was attacked because it had a huge port which brought much needed food, fuel, weapons and raw materials into the country. 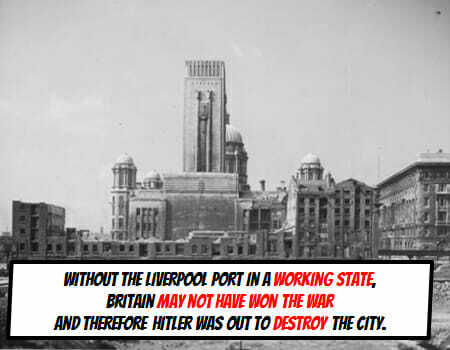 Without the Liverpool port in a working state, Britain may not have won the war and therefore Hitler was out to destroy the city. 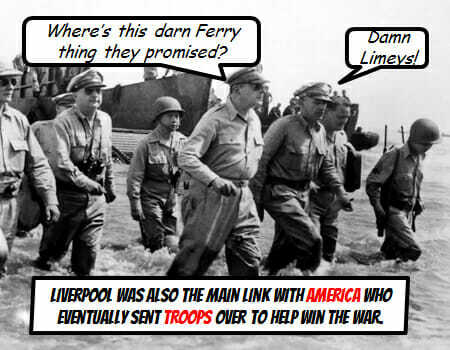 Liverpool was also the main link with America who eventually sent troops over to help win the war. 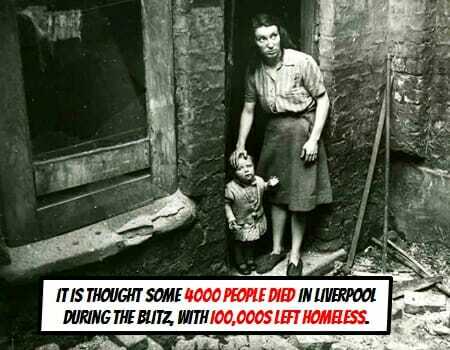 It is thought some 4000 people died in Liverpool during the Blitz, with 100,000s left homeless. 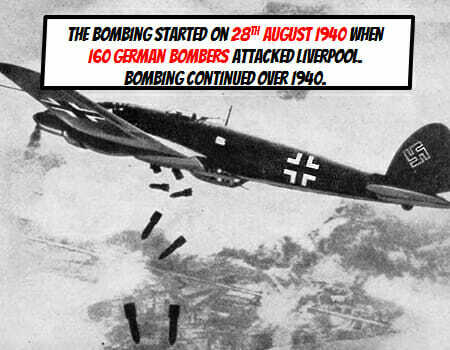 The bombing started on 28th August 1940 when 160 German bombers attacked Liverpool. Bombing continued over 1940. 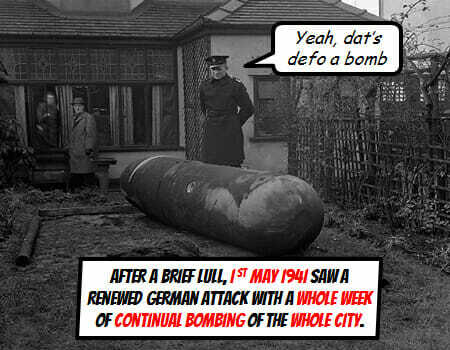 After a brief lull, 1st May 1941 saw a renewed German attack with a whole week of continual bombing of the whole city. 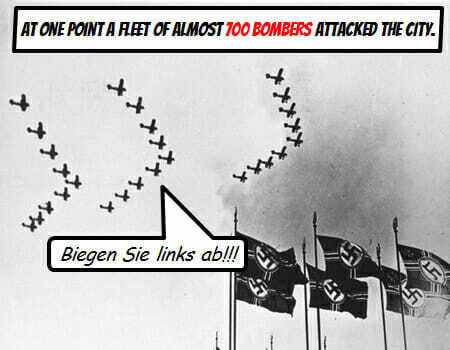 At one point during the Liverpool May blitz a fleet of almost 700 bombers attacked the city. 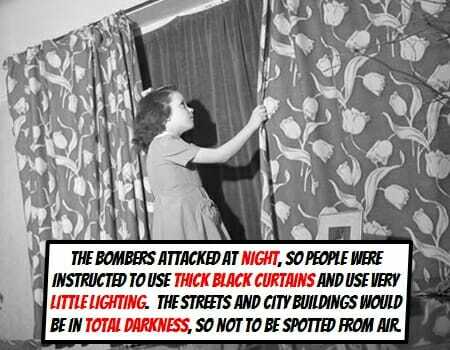 The bombers attacked at night, so people were instructed to use thick black curtains and use very little lighting. The streets and city buildings would be in total darkness, so not to be spotted from air. 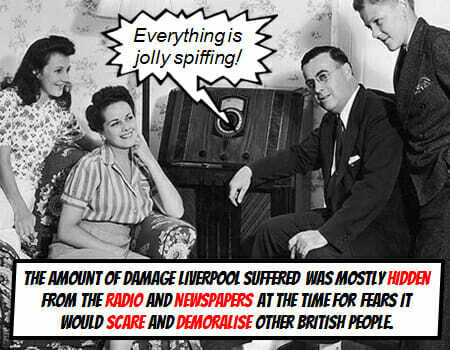 The amount of damage Liverpool suffered was mostly hidden from the radio and newspapers at the time for fears it would scare and demoralise other British people. The signs of the Blitz are still here today. Many parts of Liverpool have been left untouched since the bombings. 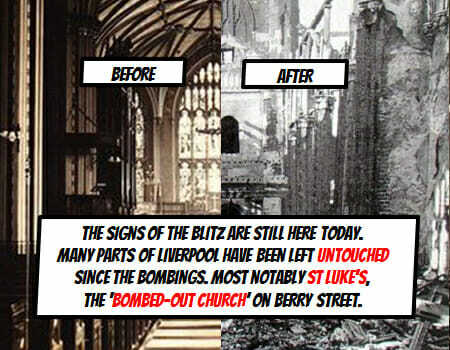 Most notably St Luke’s, the ‘Bombed-Out Church’ on Berry Street. 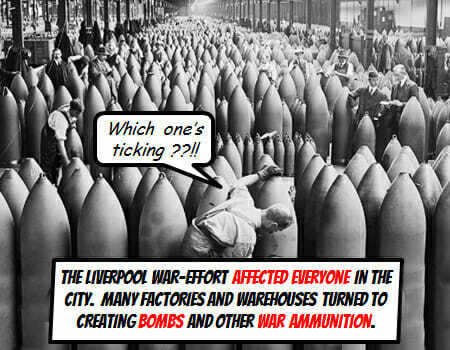 The Liverpool war-effort affected everyone in the city. Many factories and warehouses turned to creating bombs and other war ammunition. The 10th January 1942 saw the last air-raid on Liverpool. 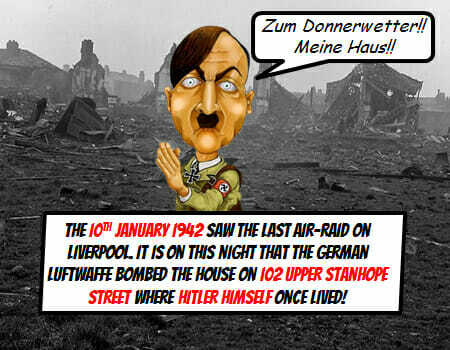 It is on this night that The German Luftwaffe bombed the house on 102 Upper Stanhope Street where Hitler himself once lived. 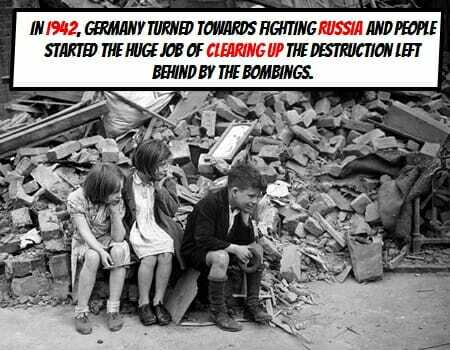 Germany then turned towards fighting Russia and people started the huge job of clearing up the destruction left behind by the bombings. The sites of many bombed buildings were cleared, dug over and then used as allotment gardens to grow vegetables on. 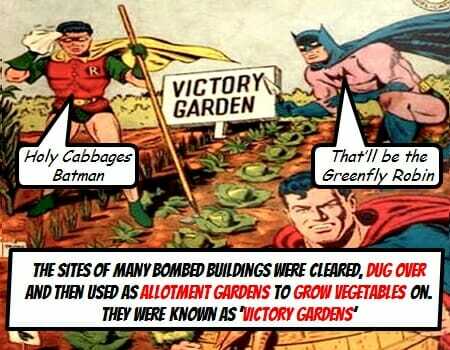 They were known as ‘Victory Gardens’. May Blitz, World War II, World War 2, Liverpool World War II, Liverpool Blitz, Liverpool Evacuees, Evacuation, Hitler in Liverpool, Liverpool in War, Liverpool second world war.